This weekend was my youngest son's (Max's) birthday. I only had a short amount of time to prepare for the party due to our hectic schedule. I went with a Halloween theme to kill two birds with one stone. This time of year is always busy for us, but the fact that my design business is booming and my three kids are getting older and more involved in extra circular activities makes every season a "crazy time of year" for us. I know what you're thinking, I'm preaching to the choir. Everyone I talk to has the same story. We are all down right busy. Yet, we still want to enjoy the pleasures in life. Like decorating. So many people have said to me, "I wish I could decorate for the holidays like you do, but I just don't have the time". As a matter of fact, someone just said that to me this morning and it inspired me to start a new series titled, "The Busy Ladies' Holiday Decor Guide". Throughout this series, I'm going to share quick, simple holiday decorating ideas. I'm not going to pretend that all of the holiday projects I do in my home should be considered quick and easy. Some projects are a little more elaborate and time consuming due to the nature of my occupation. But, some holiday decor displays at The Yellow Cape Cod (like this Halloween mantle) are put together in a matter of minutes, just before guests arrive. The Busy Girl's Series will be dedicated to projects such as this. 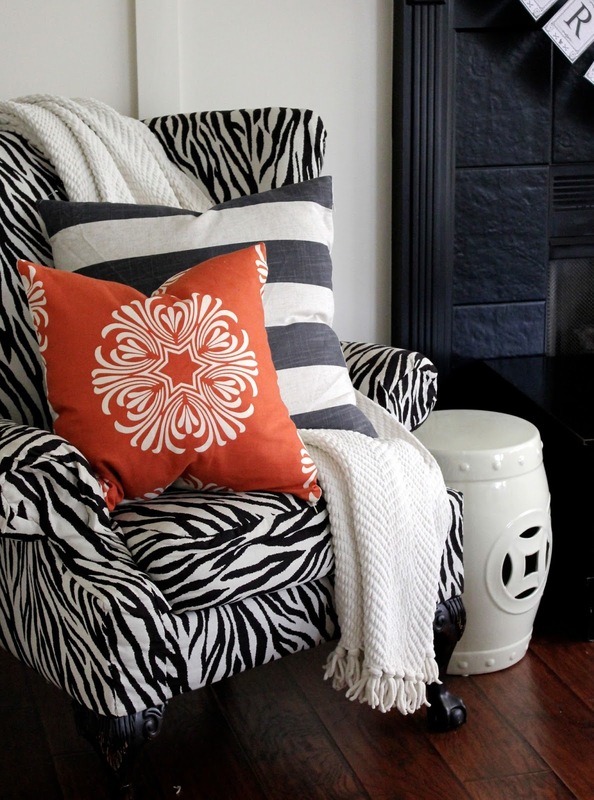 The main everyday decor I use over the mantle is a great base for adding seasonal accents. A simple black mirror, pair of chunky candlesticks and the silhouettes of our kids set a neutral backdrop. It looks great all on it's own for everyday, but with just a few small additions this mantle styling can be transitioned from season to season quickly. 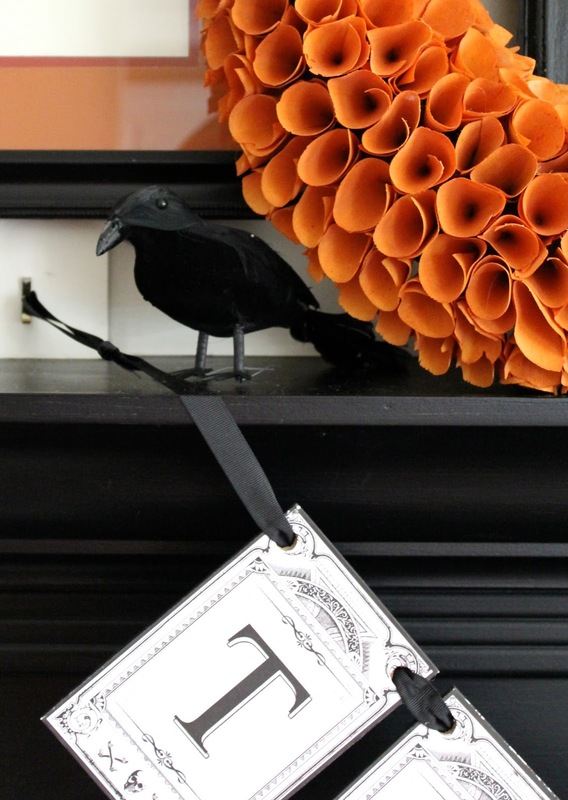 By adding a spicy orange accent color the look became very Halloween-esque. I introduced orange with three things; a toss pillow, a simple pre-made orange wreath (HomeGoods) and orange mats to frame our silhouettes. One trick that I use to make switching up the silhouette mats fast and easy, is to store different color mats right inside the frames. I have several mats painted in different accent colors tucked inside the frames. As the seasons change, all I do is flip them over, and swap the mat for whatever color meets my needs. 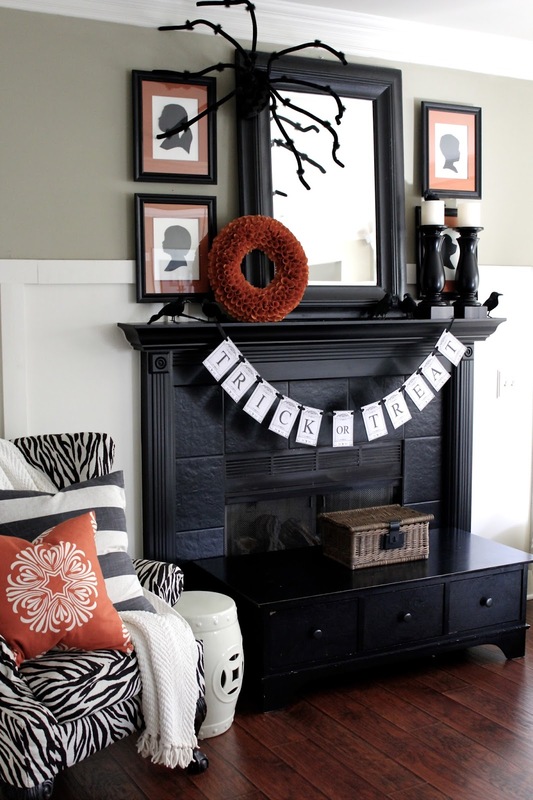 Cute banners, like this trick or treat banner (HomeGoods) are a great way to give your mantle a theme, quick. HomeGoods always has a great selection of holiday banners, or if you would like something handmade, check out Etsy. Storing a banner for each holiday right in the living room (in an end table drawer or a cute storage basket) will eliminate the need to dig through storage boxes when it comes time to decorate. Using just a few large scaled items to decorate your mantle as opposed to a lot of little things can speed up the process. It means less fussing around with the arrangement. Not to mention I like the dramatic look of large decor items. To finish off display, I added a giant spider that I found at a thrift store a few years ago, and a few black birds from the dollar store. I use these items year after year, they are fun elements that the kids enjoy. In just a few minutes my mantle was ready for the Halloween season. Stay tuned for more posts in "The Busy Ladies' Holiday Decor Guide". This year, my holiday calendar already looks busy, I'll be doing a lot of quick, simple projects that I can't wait to share with you! 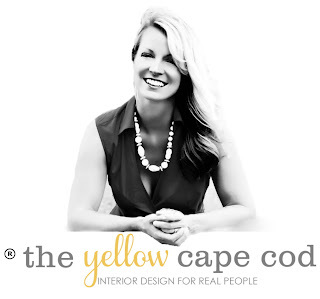 All photos credit to Sarah Macklem of The Yellow Cape Cod. Love your ideas and your blog! Following you!